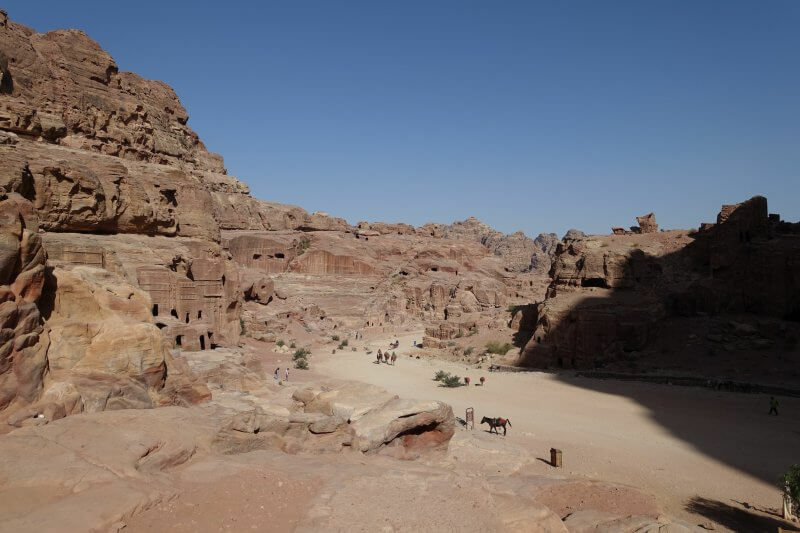 Petra, the Nabatean city carved in stone, frozen in time for almost two thousand years before being rediscovered. In recent times, it has captured the imagination of people around the world, starred in movies, and now, been ticked off my bucket list. 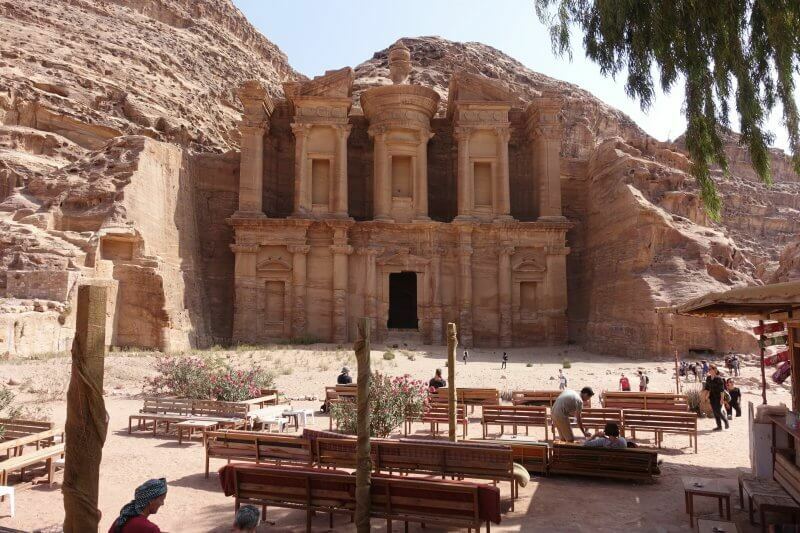 Read on to find out how you can spend 2 amazing days in the lost city of Petra. After the hike in the Arctic Circle that was a little too cold for my liking in 2016, I opted for something a little warmer in 2017, and headed for the deserts of Jordan. From Queen Alia International Airport, take the airport bus to the 7th circle (3JD). From there, get a cab to Wehdat Bus Station (South Bus Station). This should cost about 2-3JD. I thought I had it covered when I got the driver to use a meter but it ran up to 13JD, and having just arrived after a long flight, I had no idea. Another lesson learnt for me, and a couple dollars saved for you, I hope. From Wehdat Bus Station (South Bus Station), ask for the bus to Wadi Musa (7JD), which runs throughout the day. I found out the meaning of ‘waiting till the minibus (or van) is full’ here. The driver was determined not to leave the station till there wasn’t an inch of space to spare in the minibus. Anyhow, we were soon rolling down the Desert Highway, for me a mind blowing ride being my first time to the desert. 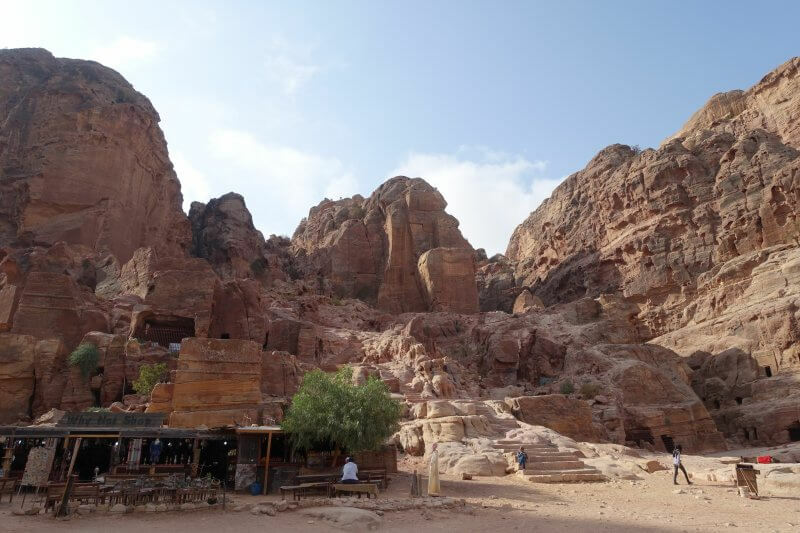 After 2 hours, the bus arrived in Wadi Musa, the town just beside Petra. There are lots of accommodation options for a range of budgets. The ones nearer to the entrance to Petra cost more, are some distance from the bus station, but are super convenient for getting into Petra. 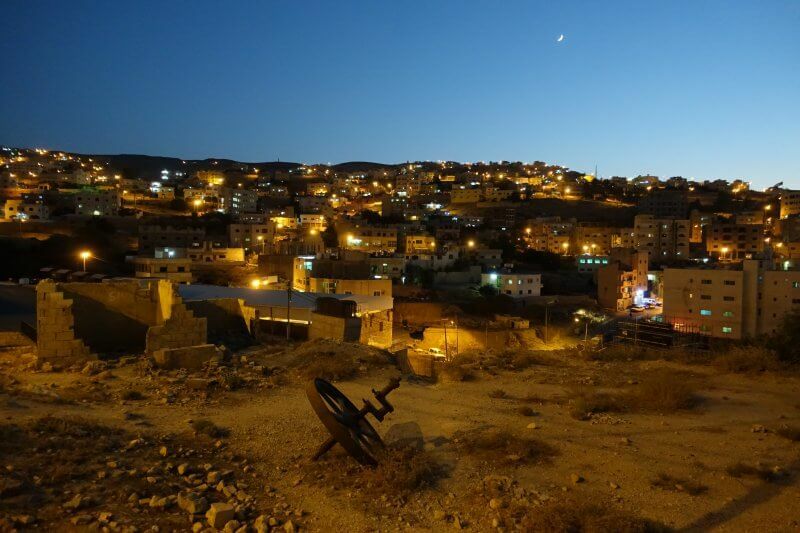 On the other hand, those higher up on Wadi Musa, nearer to where the bus ends, are cheaper and are surrounded by more food and convenience options, but are further from the entrance. 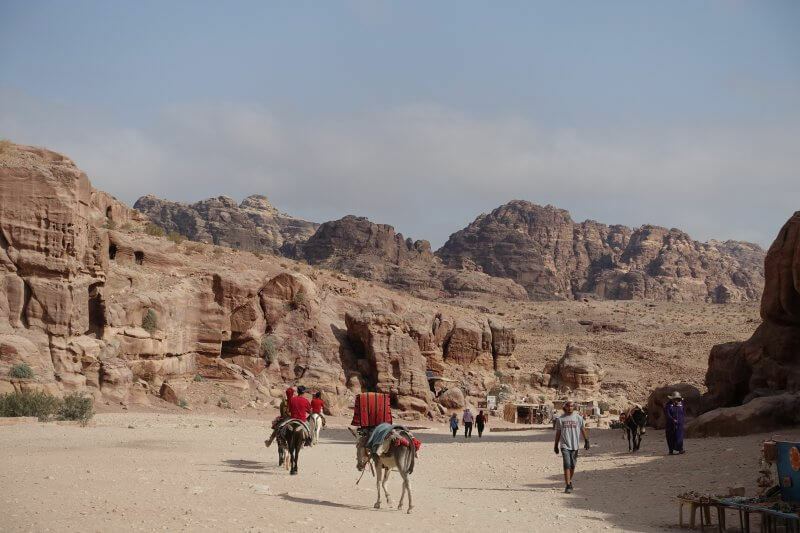 There is certainly no need for a guide in Petra, though having a knowledgeable guide may add a different perspective and story to each site. Trails are well marked and there are both tourists and locals around, should you get lost. 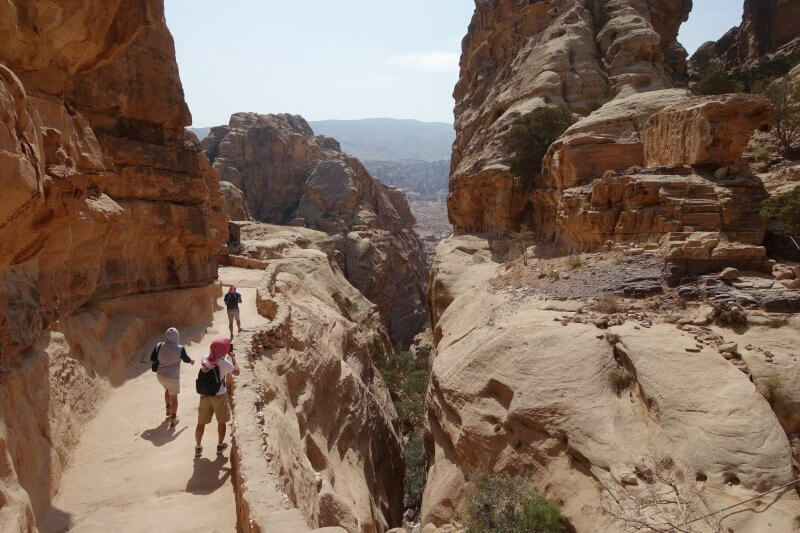 Petra is perfect for self guided hikes. The Main Trail takes you from the visitor center at the entrance to the Siq, next to the Treasury, then to a couple of temple ruins. It isn’t much of a choice for most tourists, being the only way between the visitor center and the Treasury. Between the visitor center and the Siq. As you pass the visitor center, hordes or horsemen will approach asking if you require assistance to the Treasury or beyond. Nothing unexpected for a tourist spot as this, and some consolation should you be unable to complete the walk. I politely refused and carried on, taking pictures that I thought would feel perfectly right out of a Star Wars movie. 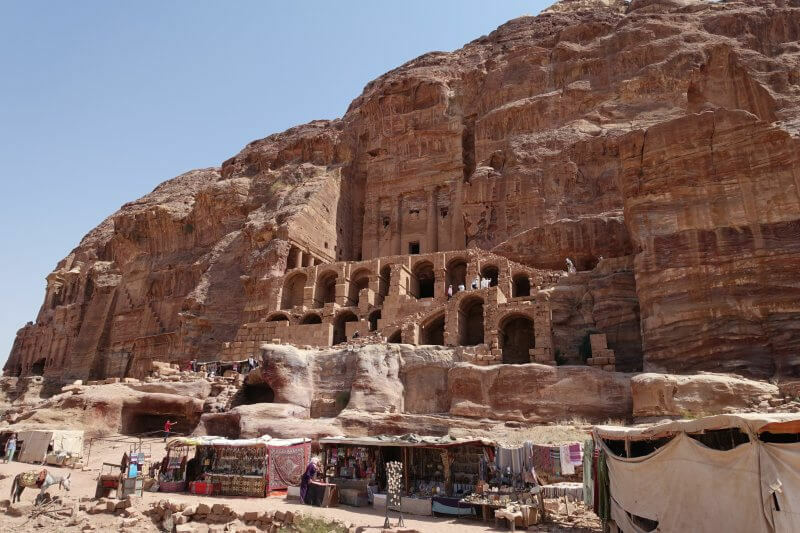 Along the way before the Siq, you’ll be treated to appetisers of ruins further inside. 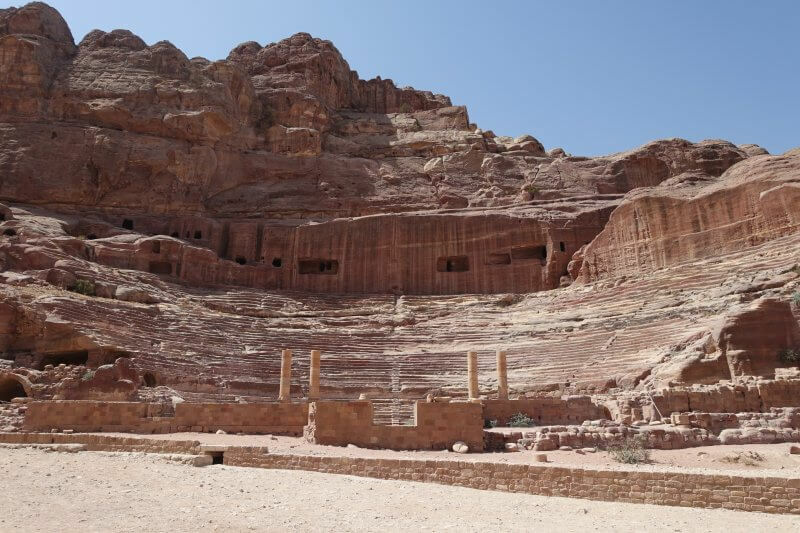 Here, among the first monuments you’d come across, the Obelisk Tomb (most of the standing structures in Petra are tombs). 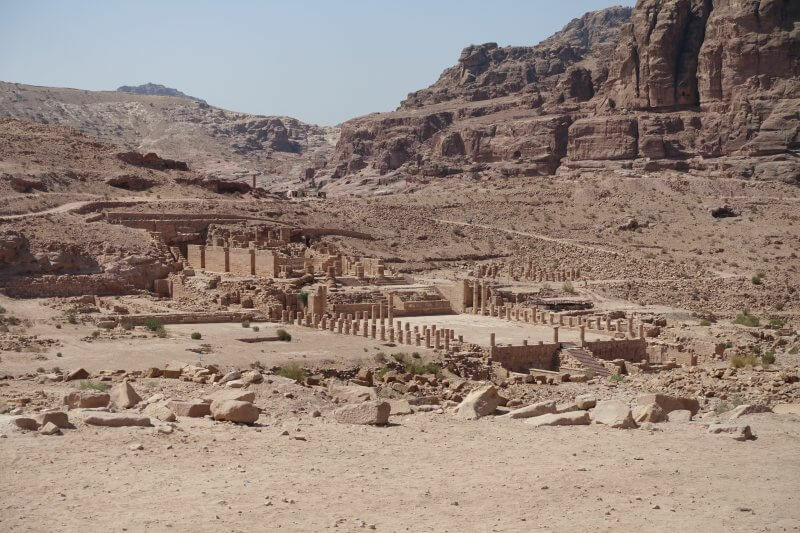 The carved facade and banquet hall below are still clearly visible after almost 2000 years. Further down the trail, it’s time for the Siq. 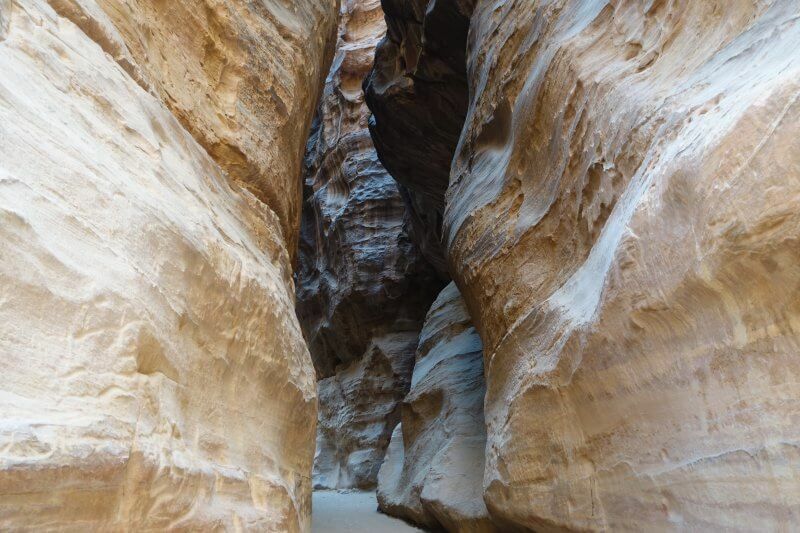 The Siq starts shallow, but quickly descends into the depths of the gorge. Sleek curves of the rock faces rise sharply on both sides of the narrow trail. 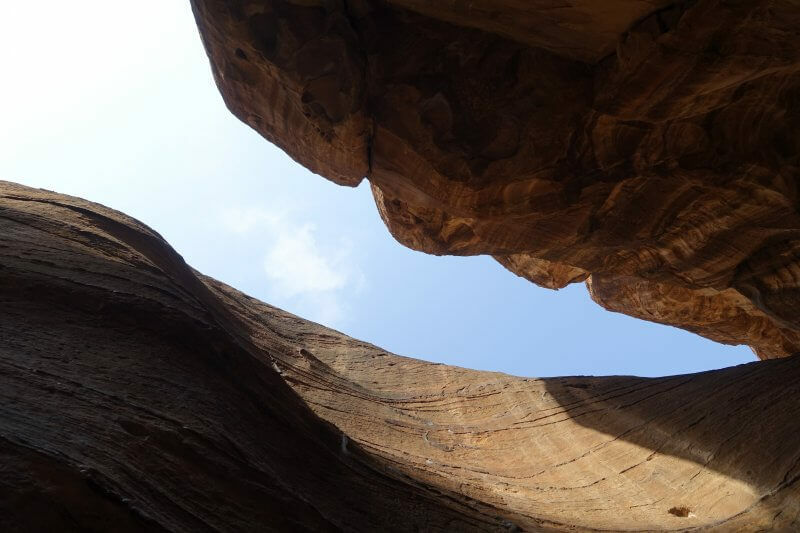 Looking up from inside the Siq. 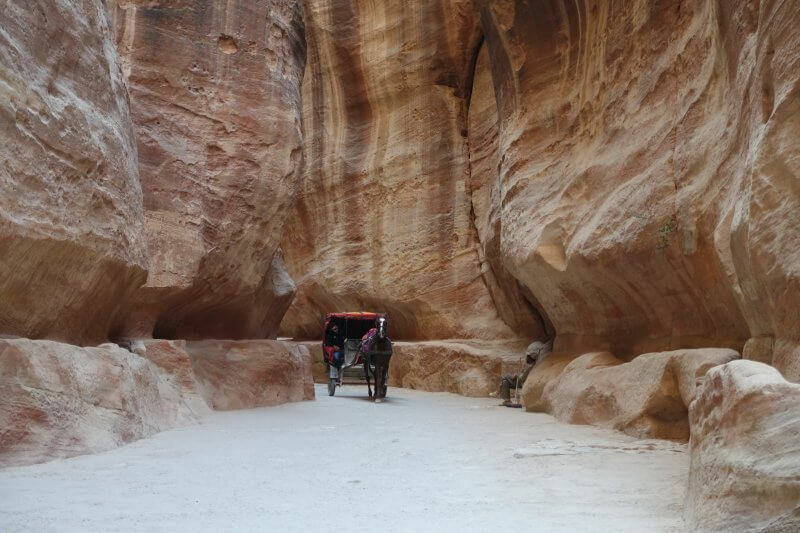 The mysterious Siq draws you in slowly and subtly, dropping little surprises behind each turn. Niche for a god carved onto the rock. 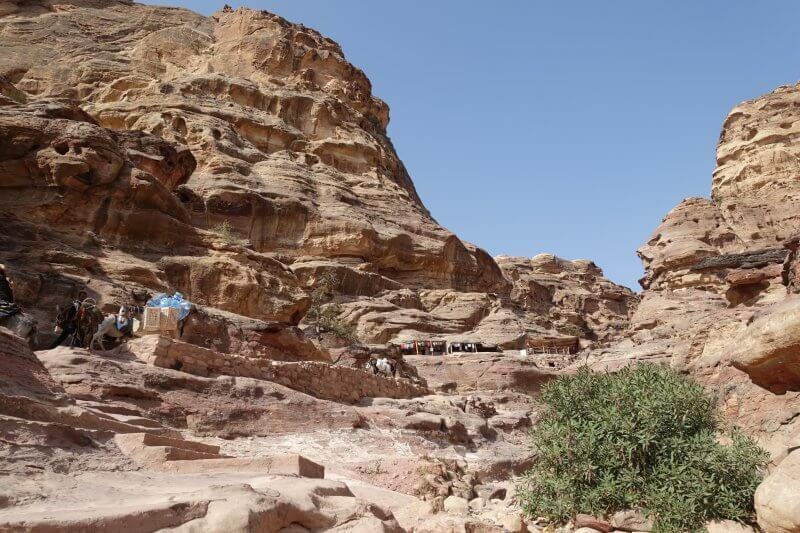 Huge groups of tourists descend upon Petra in waves, filling the narrow gorge with life (and noise). In between groups, silence blanket the floors of the Siq with a dream like atmosphere, occasionally shattered (or enhanced) by the galloping of horses echoing through. 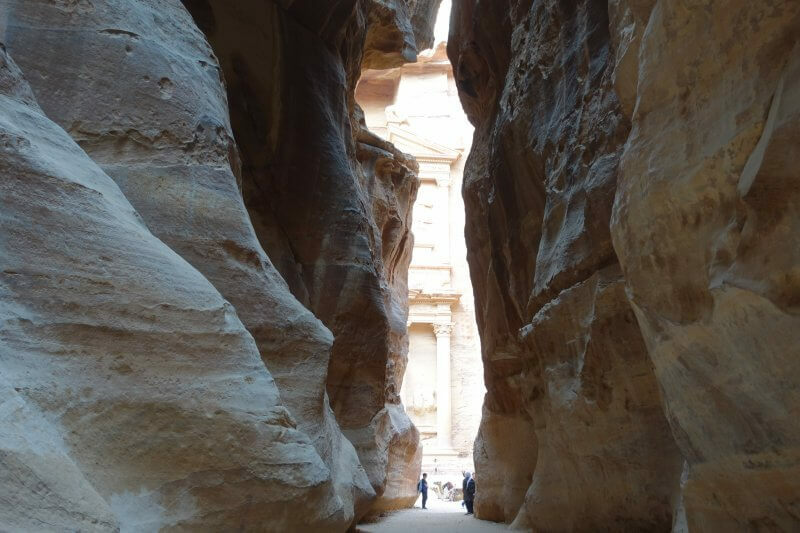 Finally, one last surprise (maybe not that much of a surprise) for the traveler still pressing on – the Treasury (Al Khazna) peering out as the light at the end of the tunnel. Words cannot adequately describe the awe that surged through me, having pictured this for a long long time, seeing it in appear in so many places and finally, witnessing this incredible sight in real life. Twists and turns and twists and turns later, the sight everyone came for! Unsurprisingly, this is one of the most crowded spots, being where everyone has to get through, and what everyone came for. Arrive early, share the space with few others, and press on for more amazing sights. 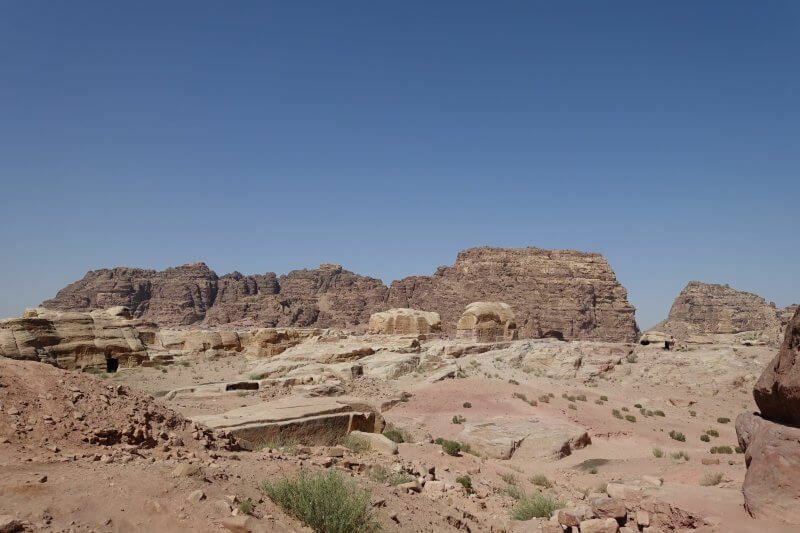 You’ve just arrived in Petra. 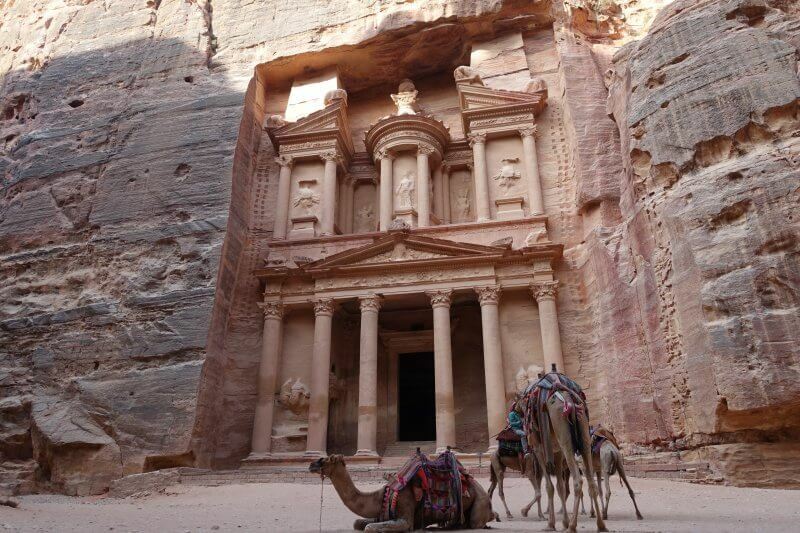 A morning with the camels of Petra, against the impressive facade of the Treasury (Al Khaznah). 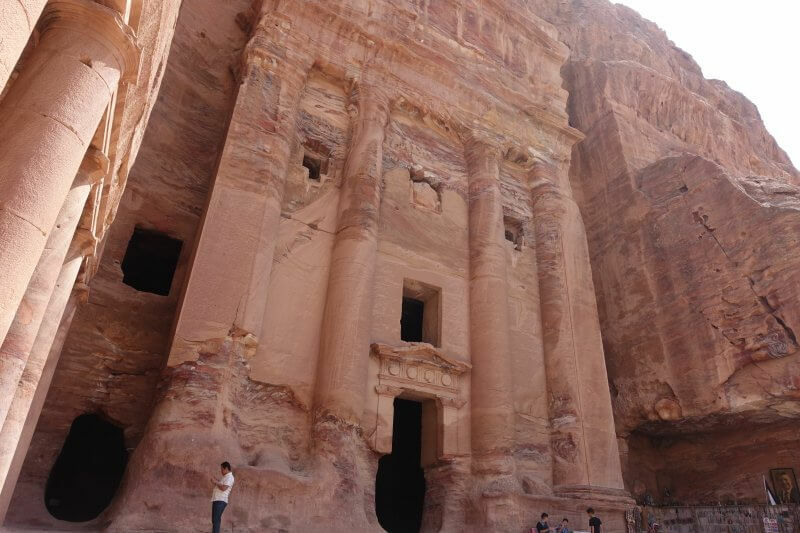 The Treasury (Al Khazneh/ Al Khazna), featured in Indiana Jones and the Last Crusade, is almost 40m tall and carved into sandstone almost 2000 years ago. Contrary to its name though, this monument was constructed as a tomb. Its name came from a myth that the urn high on the facade contains treasure, futile bullet holes on the urn confirming that it is indeed a myth. 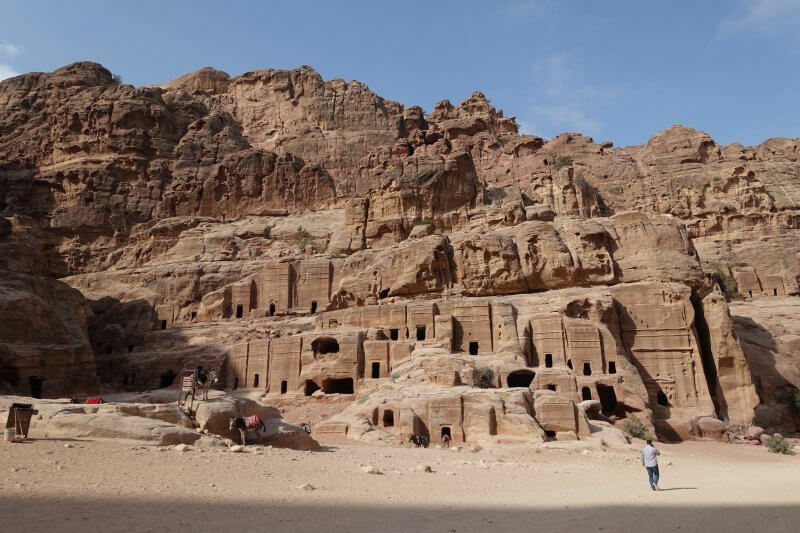 Beyond the Treasury, you’ll arrive at the Street of Facades, lined with tombs towering along the cliff face. 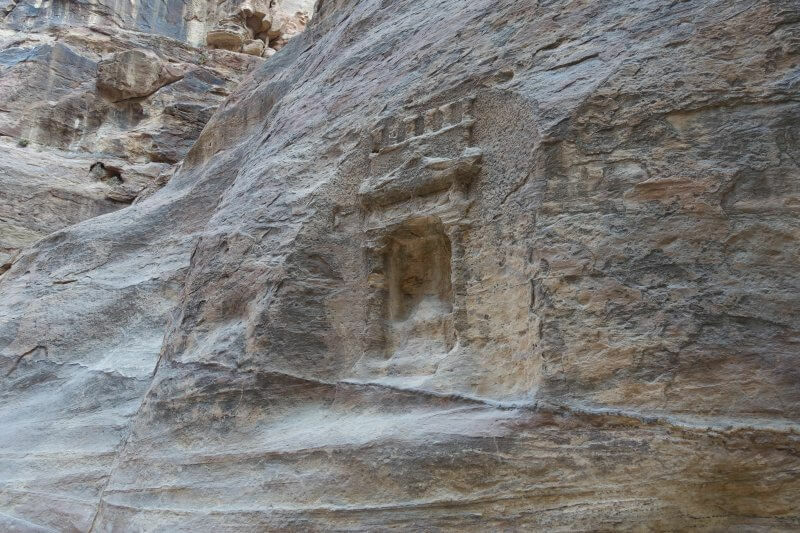 These, too, were carved directly into the rock almost 2000 years ago. Tombs along the Street of Facades. Further down, many smaller rooms carved into rock. Not sure if they were tombs too, but certainly looked straight out of some movie. 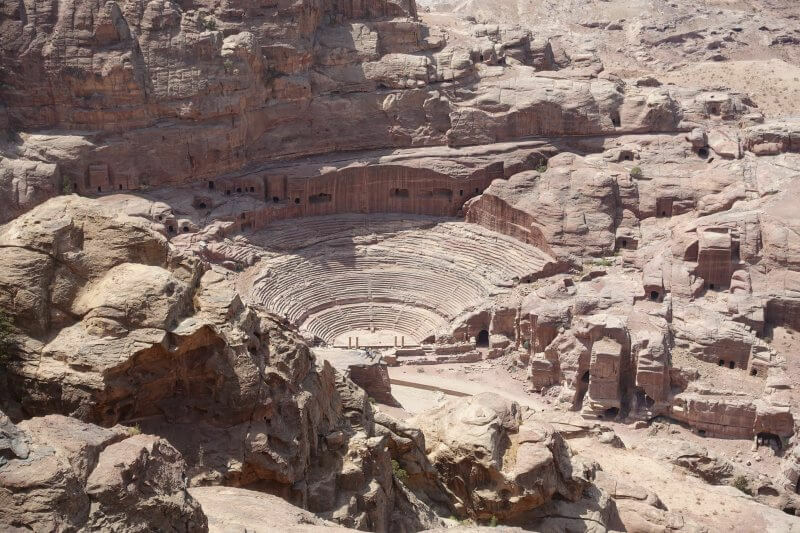 At the end of the Street of Facades is the Theatre (en-Nejr), one of the few attractions in Petra that is not a tomb. But, like almost everything else, this massive structure was carved into the rock, built with help from the Romans. 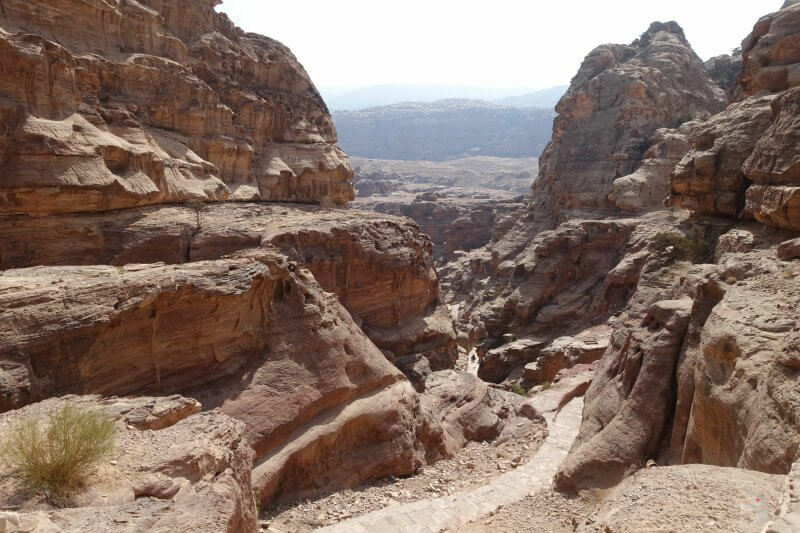 From here, the gorge opens up to the valley, and the trail is left open to the elements up till Qasr al-Bint, where the walls narrow again along the trail the the Monastery. The Main Trail follows along the Colonnaded Street, refurbished during the time of the Romans. I’d imagine it would have looked impressive in its time, paved walkway lined by Roman columns, with great temples on either sides. If you take a small detour to the right of the Main Trail, slightly uphill, you’d come across the Church. 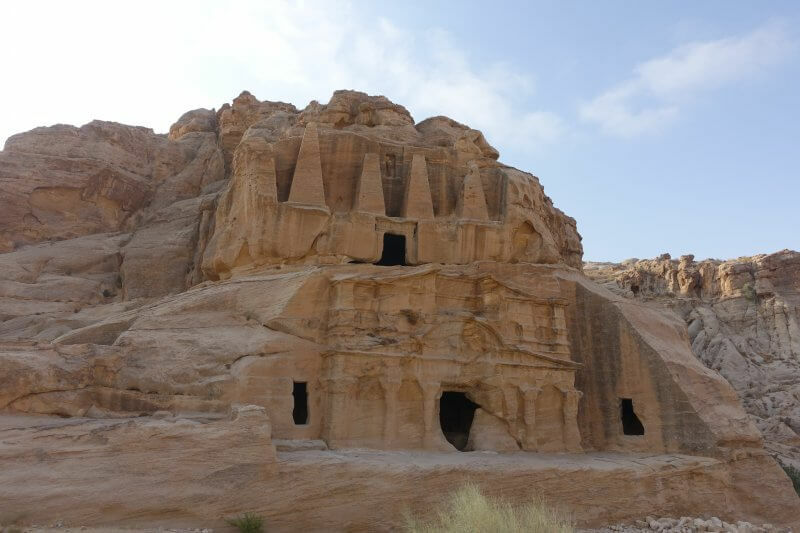 It is a much later addition beyond the time of the Nabateans. The mosaic inside the church are pretty rad! 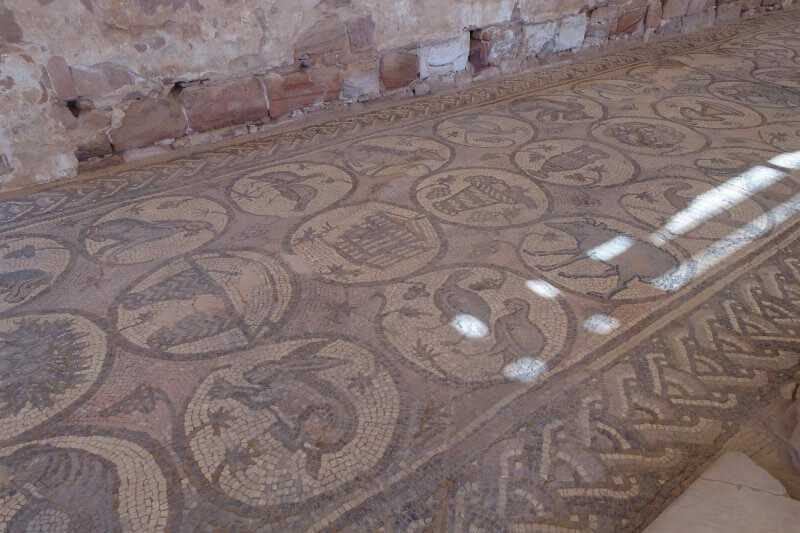 Mosaic floors in the Church. Outside the Church, look across the Colonnaded Street below, and see the Great Temple. Looks huge! The Great Temple, from the Church. Back on the Colonnaded Street, up a little flight of stairs to what remains of the Great Temple. Not far from the Great Temple, at the end of the Main Trail, another imposing structure comes into view. 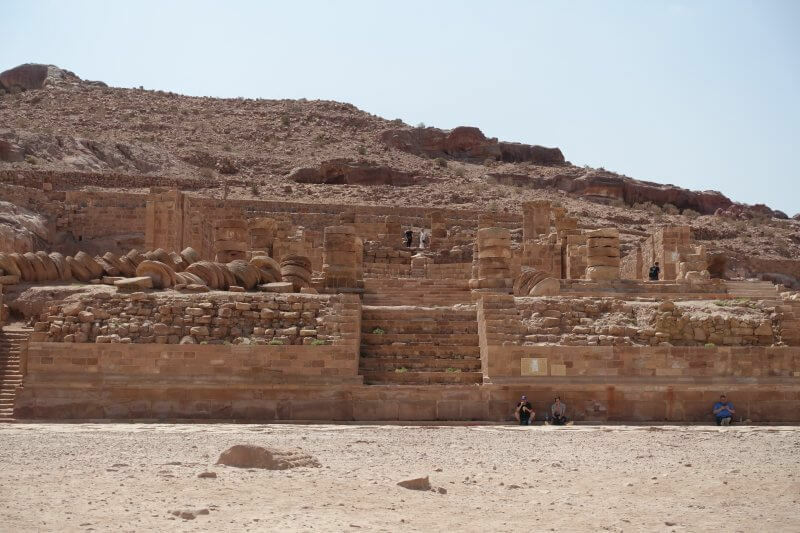 Rather than being carved into rock, Qasr al-Bint is a huge freestanding temple dedicated to Dushara. Once covered in marble and rising 23m into the sky, it is still a sight to behold today. And that takes us to the end of the Main Trail, which should leave enough time for at least one more trail for the day. Elevation: Lots of steps, moderate. From the end of the Main Trail, the Ad-Deir (Monastery) Trail winds between rocks, rising with the mountains, emerging at the Monastery (Ad-Deir), and shortly beyond, you’ll be rewarded with a view over the desert mountains, before having to turn back all the way to the Main Trail again..
Start of the Ad-Deir Trail, where the path narrows again. The crowds thin as you get further from the Main Trail, and looking back, it’s hardly a place I recognise. The Mars like landscape of the sandstone desert. 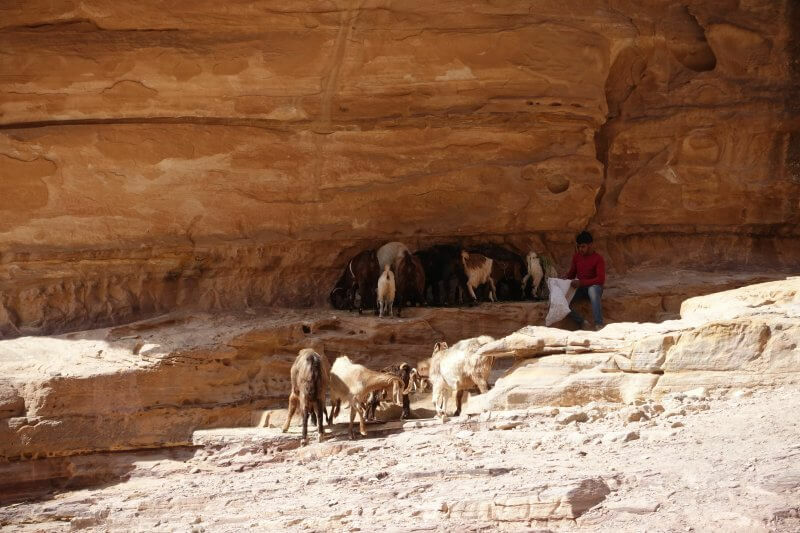 Bedouins live along the trail, mostly setting up stalls to ambush unsuspecting tourists (though mostly not pushy), and a few herding goats and sheep along the treacherous terrain. With each step, anticipation grows, as with the weariness and lactic acid in my thighs. The trail rising steeper along the way. Turn back every now and then for ever changing, out of this world vistas. Not recommended for those with severe acrophobia at some points though. Presenting the Monastery (al-Deir)! 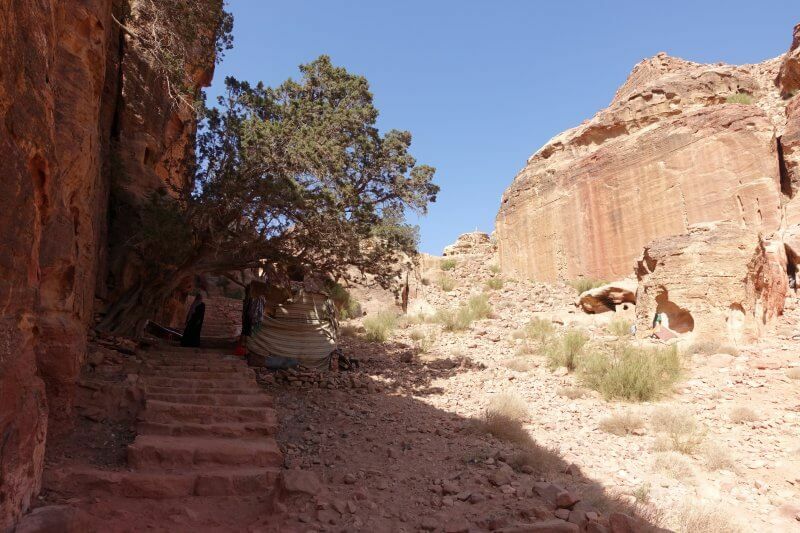 The trail emerges from the right side of the Monastery, and you can find a cafe/ restaurant directly facing it. Great for a rest and some refreshments, before hitting the road again. 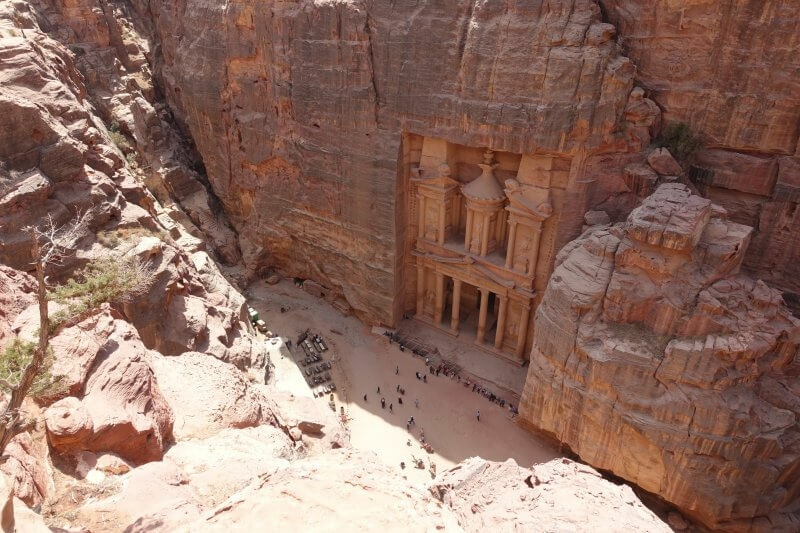 Starring in Transformers: Revenge of the Fallen, the Monastery (Al Deir) is one of the largest monuments in Petra (larger than the Treasury). 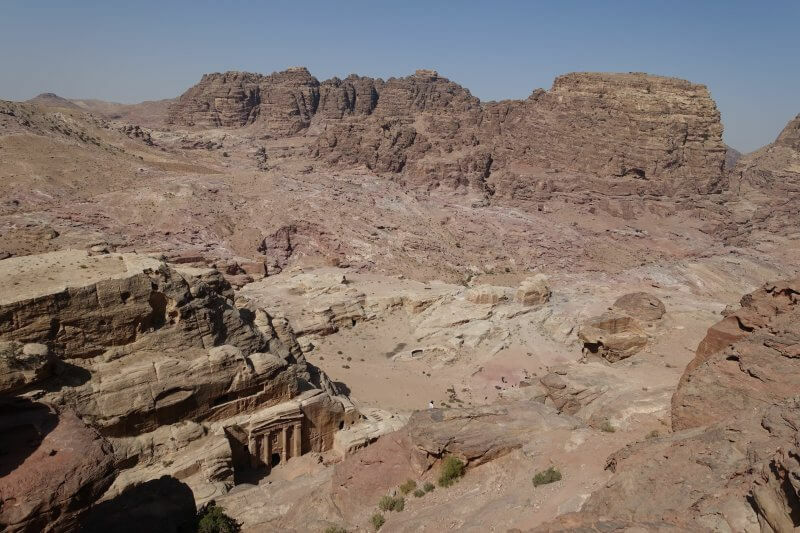 If you follow the trail across the facade of the Monastery a couple of hundred meters down, you’d find panoramic view points over the desert mountains. Some of the viewing points are occupied by stalls requesting that you buy a drink from them, but there are a couple of spots free of such sales tactics too. Take a shade under the rocks and enjoy the view. The view is pretty similar to the one from the High Place of Sacrifice Trail I’d mention later on, so saving it for later. Meanwhile, turning back towards the Monastery, then back down the trail all the way to the Main Trail. Coming back from the panoramic viewpoint, passing the Monastery. The trail down the mountains is directly ahead, the gap to the right of the Monastery. This time, enjoy the evolving views across the desert scape without having to turn back. One of those places where it may not be a good idea for those with acrophobia to look down. Facing the silhouette of the mountains as you return from the Al Deir Trail. I decided on option 2 since it was still early in the afternoon, but honestly option 1 would be great choice too. Especially after the Monastery Trail and if you haven’t been exercising frequently, like me. 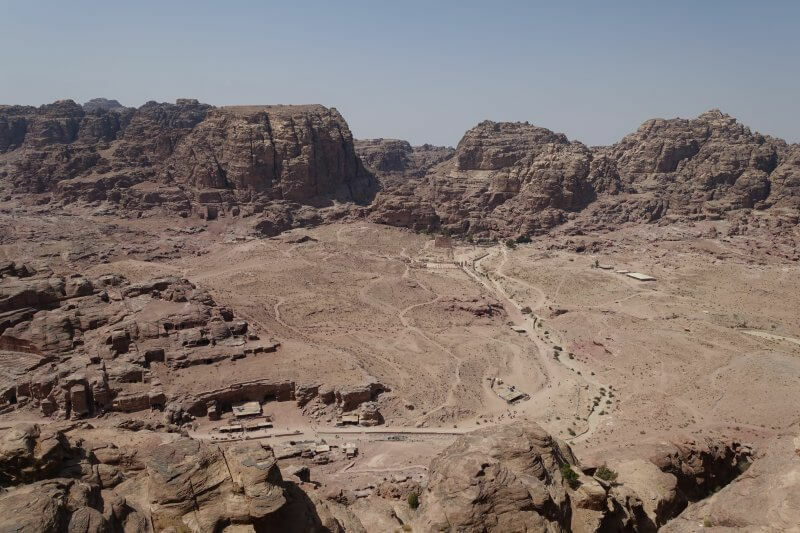 Amazing view of the Royal Tombs from the Church, with the Main Trail a short distance below. 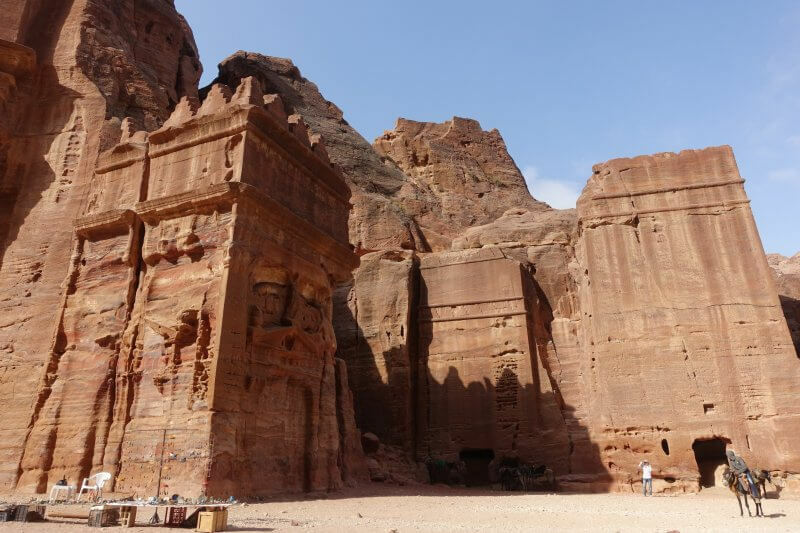 The Al-Khubtha Trail follows in front of the Royal Tombs before going steeply uphill for that stunning view of the Treasury from the top of the mountain. I was feeling great after finally seeing so much of what I had been dreaming about, in real life, in just one morning. 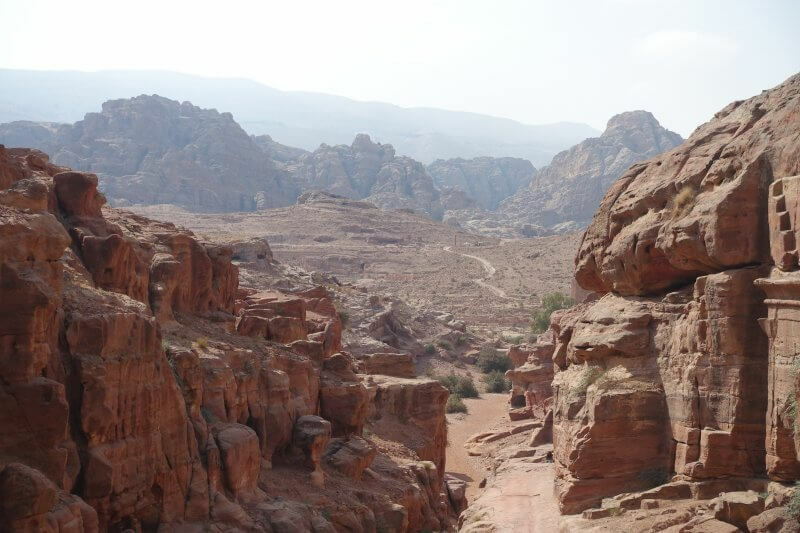 Reaching the ‘city center’ of Petra once more, adrenaline fuelled my drive to conquer the next most popular trail (next by very far), the Al-Khubtha Trail. The Urn Tomb. Shops selling all sorts of souvenirs and trinkets crowd every possible path along the Street of Facades, and sellers jostle for the fleeting attention of passing tourists. 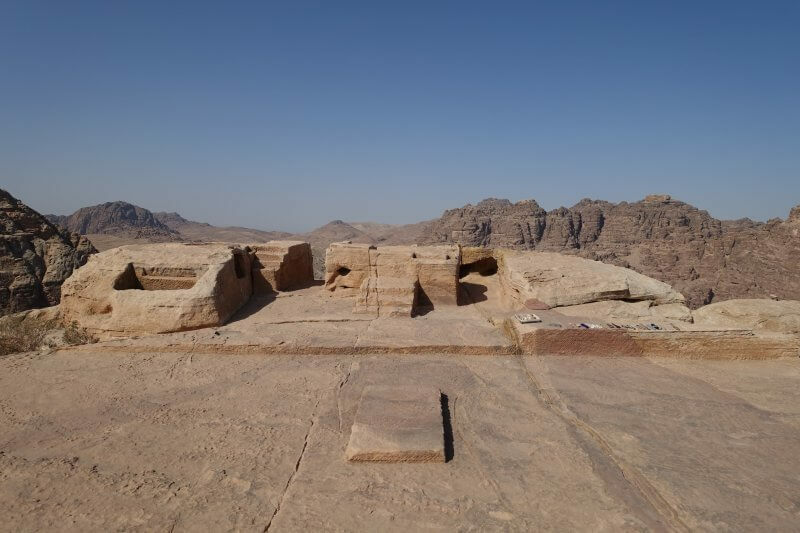 The courtyard in front of the Urn Tomb offers expansive views of the surrounding landscape, and the colonnades on both sides of the courtyard offer respite from the desert heat. On the courtyard in front of the Urn Tomb. Facade of the Urn Tomb, up close. Beyond the Urn Tomb (so named because of the Urn on its facade), a couple of towering, intricately carved tombs complete a series of tombs known as the Royal Tombs. 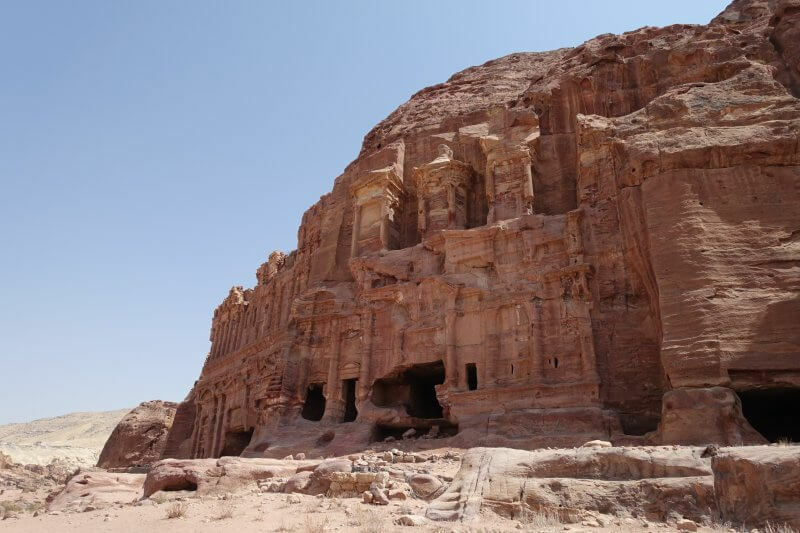 There is the Silk Tomb, Corinthian Tomb (below), and the Palace Tomb, each named after various features on their facades. 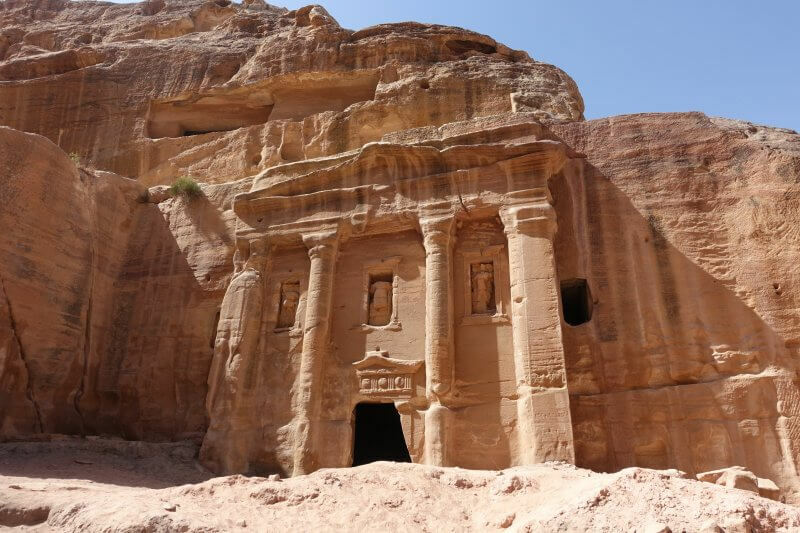 The Corinthian Tomb, combining various elements of Nabatean and classical architectural styles. 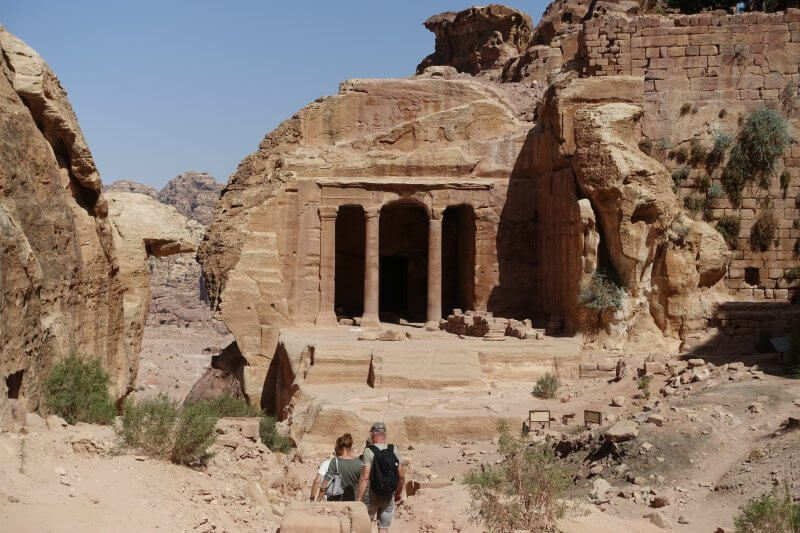 Walking beyond the Royal Tombs and continuing along the Al-Khubtha Trail, the throngs of tourists withered down to next to none, and I spent the next hour or so alone climbing up two thousand year old steps around the mountain. After what seemed like an endless, winding flight of stairs under the scorching sun, a signboard appears out of nowhere, gesturing you towards the cliff. I took the plunge (figuratively), and found out just how high I had climbed. After all the effort to get here, you wouldn’t want to miss this. 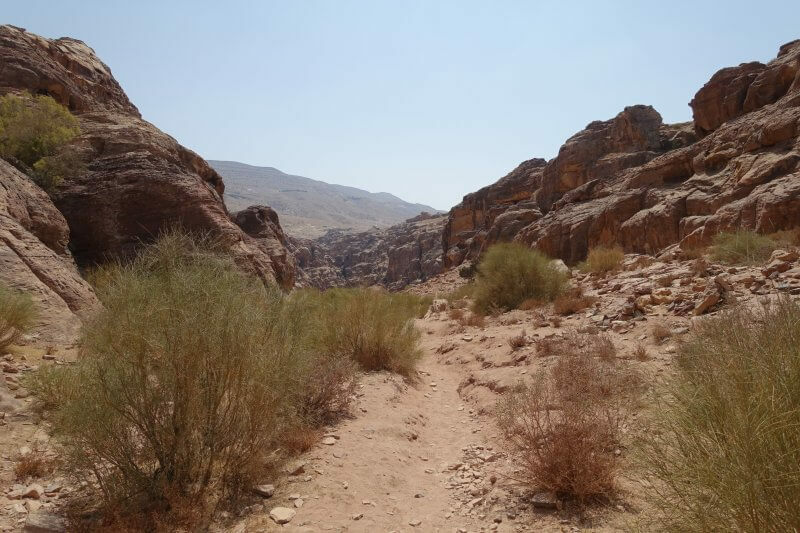 Here you can see the Main Trail, heading towards the mountains where the Al Deir (Monastery) Trail begins. Looking down at the Theatre. Along the mountain top to see the Treasury from above. 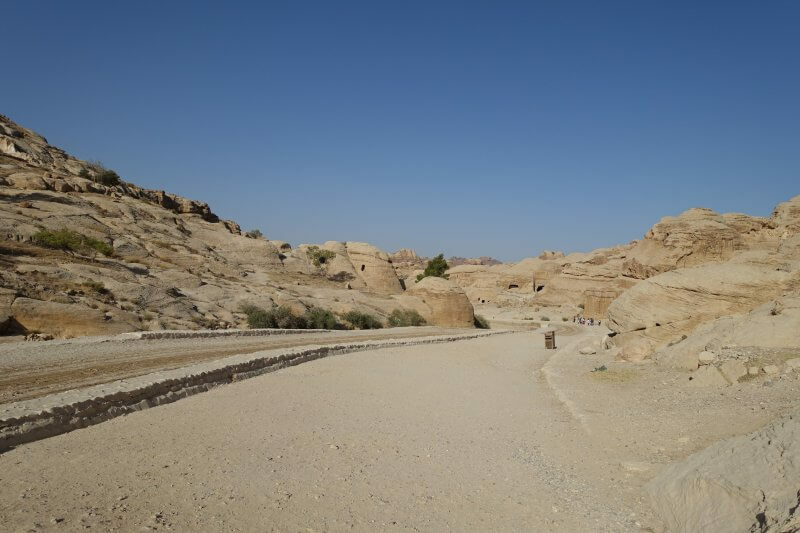 From the view point to the end of the Al Khubtha trail (above the Treasury), the trail is relatively flat, but the path can be unclear at some parts. And finally, that elusive, hard earned, Instagram worthy view of the Treasury from above. 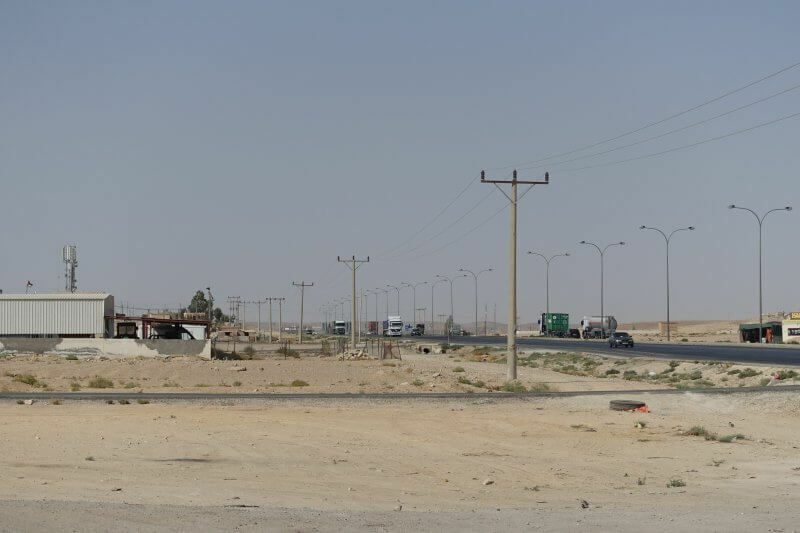 There was a stall occupying the best spot, and being tired and thirsty, I relented and bought a small drink at 1 JD (more than 3 times the price in Wadi Musa). The shade and ice cold drink was a perfect way to end the hike. There was only 1 other traveler up there and we chatted for awhile before making our way down. Priceless view of the Treasury from above. Where people pose with their legs dangling over. But I try to be a little different so I took out the legs. Definitely not one for acrophobics. Comfy cushions on which to enjoy the view. Soon the euphoria wore out and it was time to go down. Here’s why I wouldn’t recommend doing this trail along with the previous 2 on the same day: my thighs started cramping on the way down, and cramped all the way back to Wadi Musa, which isn’t entirely pleasant given the distance to cover, and that my guesthouse was situated some distance uphill. Felt bad that I had to make the other guy whom I met at the top wait, as his guesthouse was also uphill and we agreed to go back together. Anyhow, with some fitness, you’d find your way back, where stalls selling similar looking food wait for you in Wadi Musa. Have a well deserved meal and rest, another day of hiking awaits. 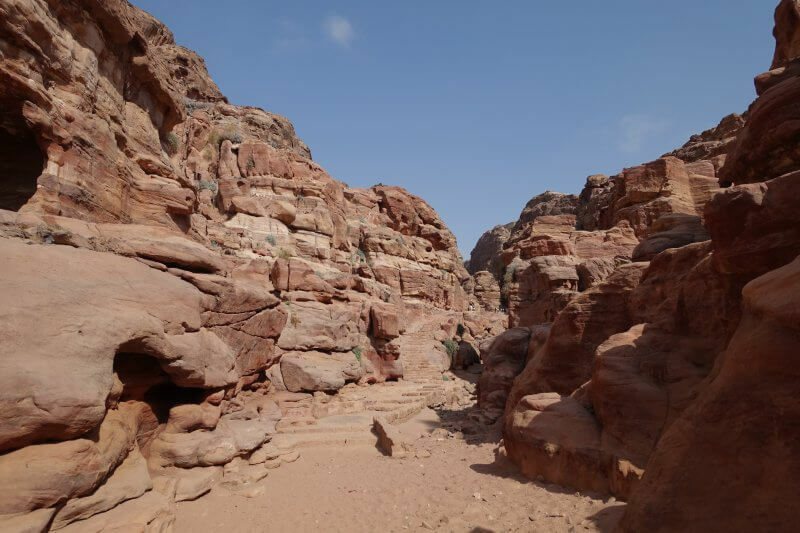 If you had done the Al Khubtha trail on the second day, when you reach the Main Trail again, simply cross over to the other side of the street for the start of the High Place of Sacrifice Trail. Continue below for more! 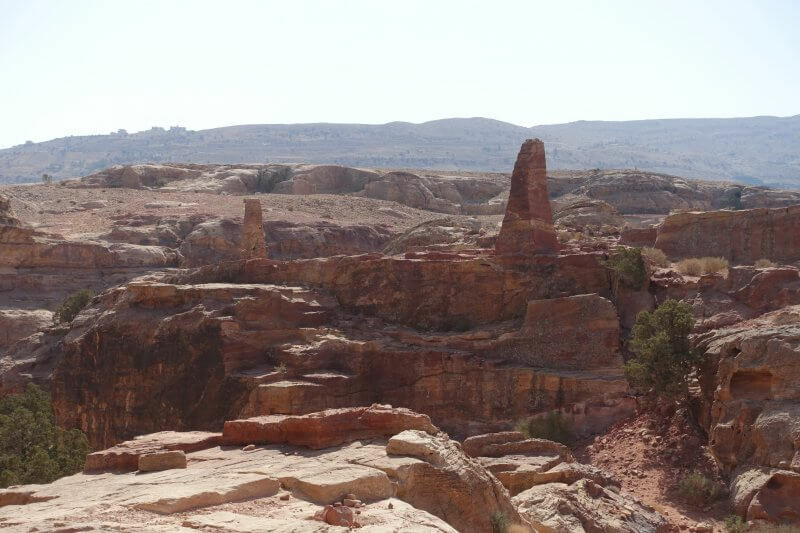 The nice thing about the High Place of Sacrifice Trail, as compared to the other 3 trails, is that it is a round trip, so you will get brand new views every step of the way. To find the start of the trail, get to the end of the Street of Facades. If you are coming from the Treasury, look to your left for a shop called ‘Why Not’. To the right of a shop, you will find a flight of stairs leading up the mountain. That’s what you’re looking for. A good challenge. The flight of stairs marking the start of the High Place of Sacrifice Trail. On the right of the shop, in the middle of the picture. 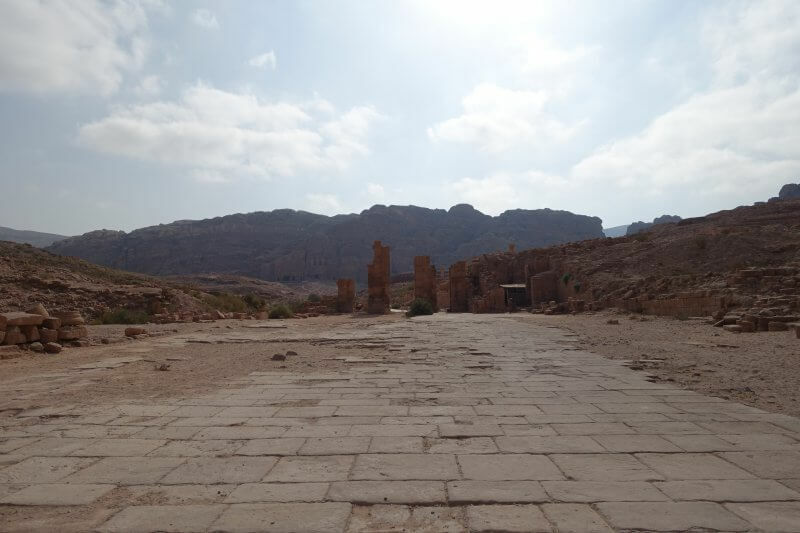 It’s already my second day in Petra, but every step of the way still left me in awe. Just look around you, anywhere, everywhere, and you’d be amazed that this is all real. Including the soreness in your legs. Another scene that looks straight out of a movie set. There were slightly more people on the High Place of Sacrifice trail than the Al-Khubtha trail when I did it the day before, but nonetheless fellow tourists were few and far between. The trail squeezing between crevices. Spot the woman under the tree, waiting for you to peddle her goods. The High Place of Sacrifice Trail felt much lighter and quicker to get to the top. At the top of the mountain, surprise, the High Place of Sacrifice, a sacrificial platform on a high place. Jokes aside, you might imagine how rituals used to take place at this very spot. Look around and enjoy the view of the desert that seems to stretch out to eternity here. Don’t stop at the High Place of Sacrifice, but instead carry on in the same direction till the end of the mountain top. Peer over the edge and see Petra from above, this time from the opposite side. Here’s looking at you, Petra. 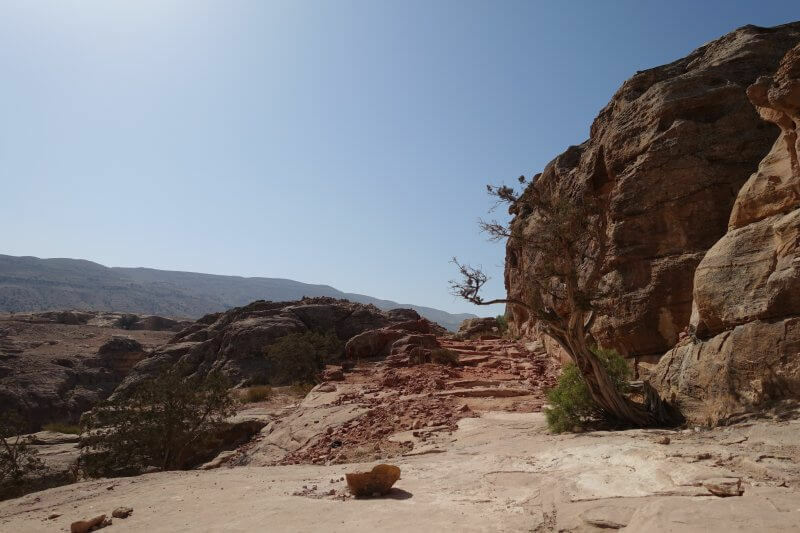 There might have been a trail down that face but it wasn’t recommended without a guide, so the most sensible option would be to turn back to the trail beside the Hight Place of Sacrifice, and continue over the mountain, to the other side of Petra where few venture. Back on the trail, where few things grow, and things go slow. Two huge obelisks, amazingly carved from stone too, not far from the High Place of Sacrifice. From the top: Tomb of the Roman Soldier just below, and Mars in the distance. Look out for the Lion Fountain on the long and winding path down to the hidden tombs. By now severely eroded, but must have looked very different back in its day. At the valley floor, a series of ancient tombs each with distinctive styles await the intrepid explorer. Tomb of the Roman Soldier. So named for the sculpture of the Roman soldier on its facade. 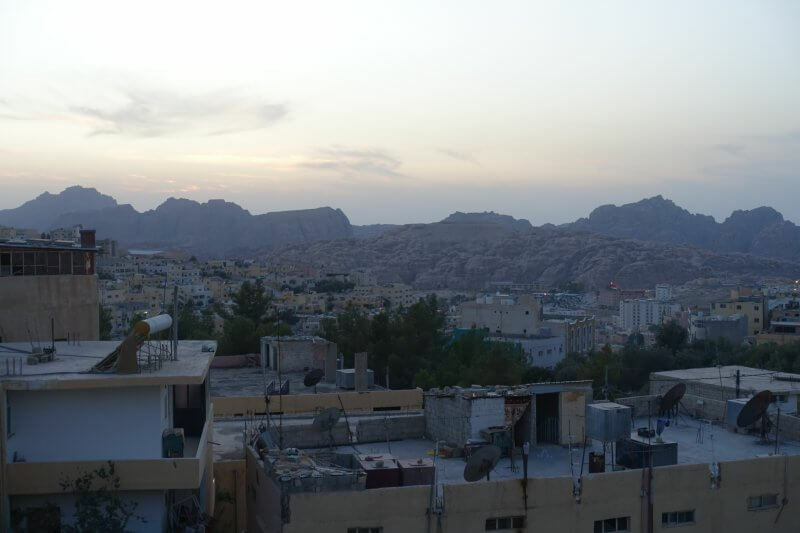 As the valley opens up, the view of the mountains in the distance, and bedouins going about their daily lives, this time closer to the ground. 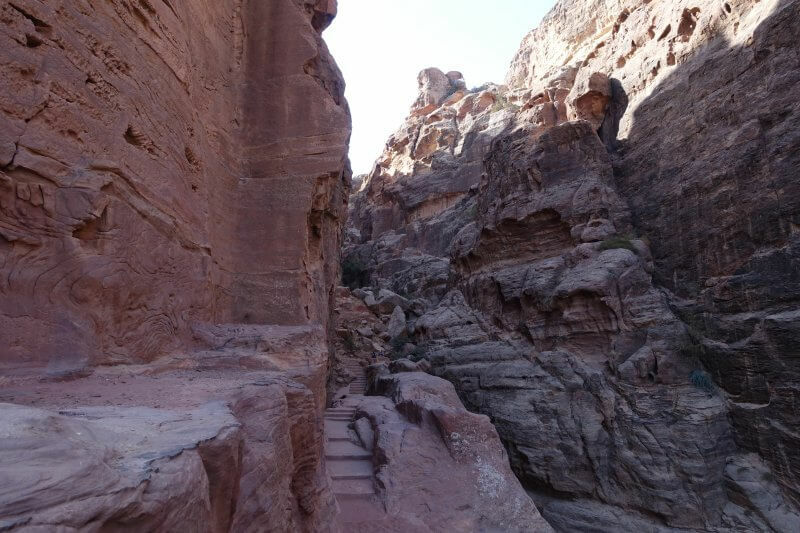 The High Place of Sacrifice Trail will bring you on a loop back to the Main Trail, emerging somewhere between the Theatre and the Great Temple. Alternatively, instead of turning back to the Main Trail, continue ahead towards Qasr al-Bint. 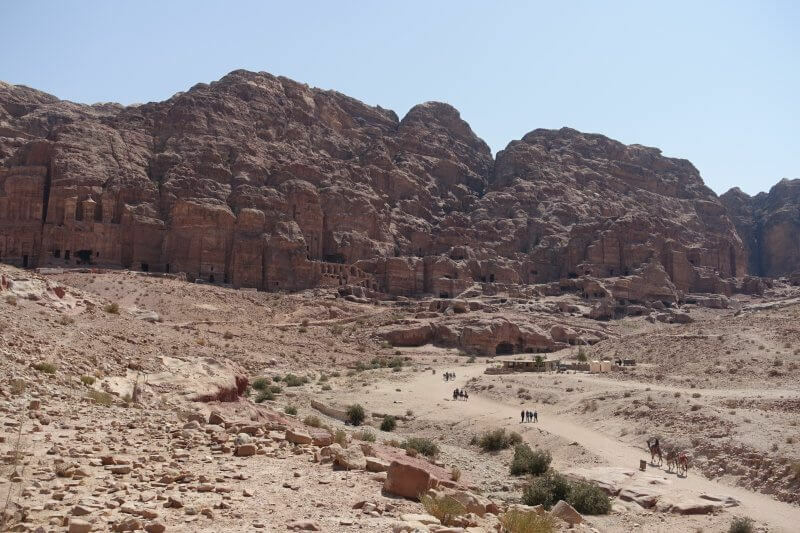 And that’s it, 4 must do trails if you have 2 days to spend in the one and only, Petra. 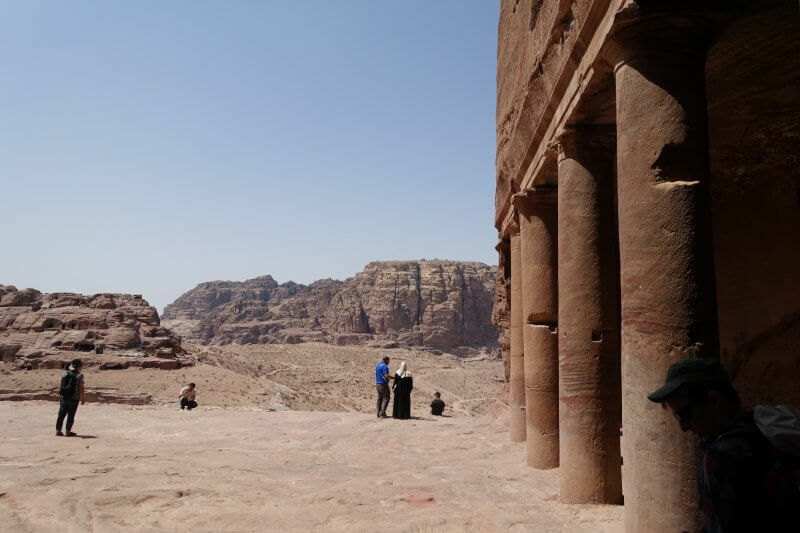 My time in Petra were absolutely mind blowing, and I’m sure it will be for you too.There’s definitely nothing quite like Petra, and most certainly worth the trip, though a little pricey. 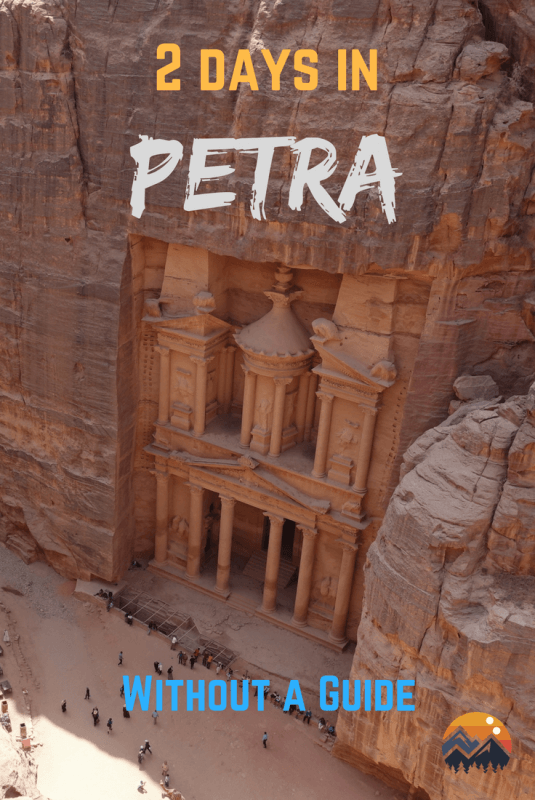 Have you checked out Petra before? Tried the 4 trails? Or something more? Leave me a message in the comments below! Sunset from My Home Petra. Thank you Aaron. This is what I am looking for. Great post!!. 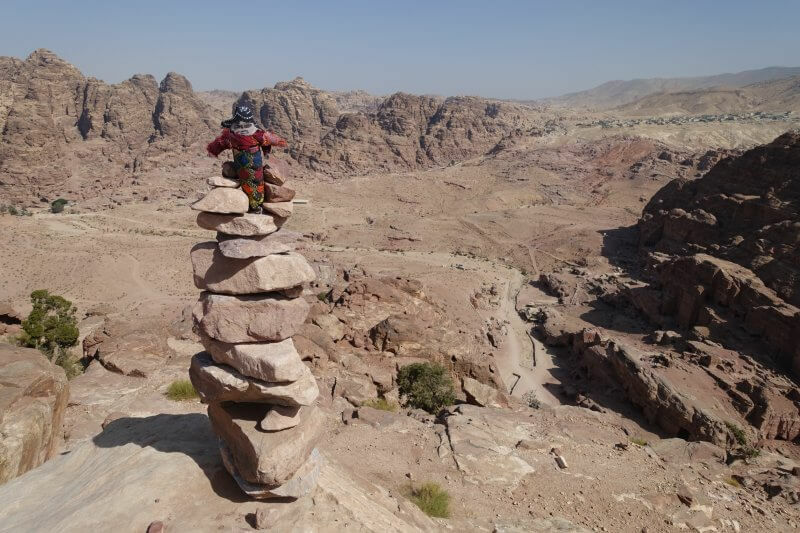 Hope I can do this all on my upcoming trip to Petra. thanks this has been useful. 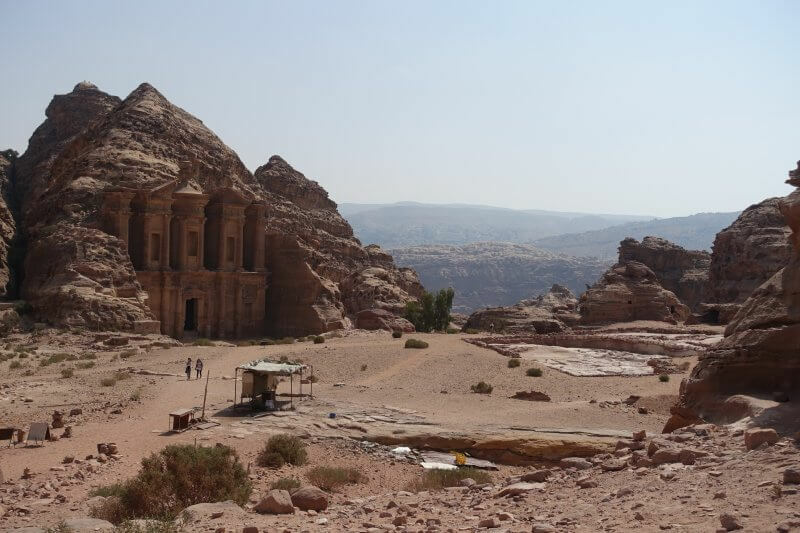 Hi Aaron, I find your blog really useful for my planning to Jordan this October. 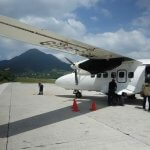 I’m also from Singapore and will be travelling solo and renting a car. 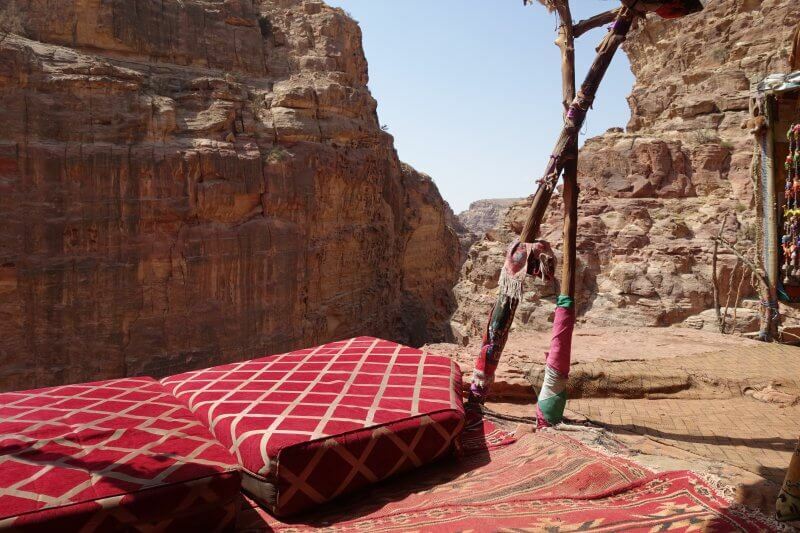 Just want to check with you should I go for 3 full days at Petra?